If you would like to have a card in your wallet that opens the doors to the most exclusive VIP clubs in the world, then it is just a few KLM Aviation Inc. flights away. 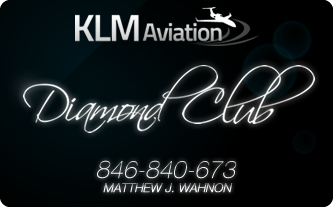 The KLM Aviation Inc. Diamond Club is the premier gateway to the finest events, restaurants, spas, concerts, performances, night clubs and many other destination hotspots. Looking for an escape? The KLM Aviation Inc. Diamond Club offers exclusive, private, confidential getaways to fulfill your every dream and desire.